The WaterMaster 300 is CALLAHEAD’s largest commercial sink providing 3 commercial grade sink basins to handle any size job large or small. It is the perfect solution to ensure outdoor special events including food festivals, concession stands, catered events, carnivals, fairs, fund raisers, food vendors or food markets as well as heavy duty work sites such as construction job sites or emergency service sites are health code compliant. Durable to handle the toughest jobs, the WaterMaster 300 can handle the cleaning of food, heavy duty cookware and utensils to cutting through grease, paints and solvents as well as mechanical parts and products alike for your hygienic protection. The WaterMaster 300 is constructed of stainless steel making it easy to wipe clean and disinfect for your sanitary protection. The sink requires 110 volt power connection, but if no electricity is available CALLAHEAD can supply our optional generator. 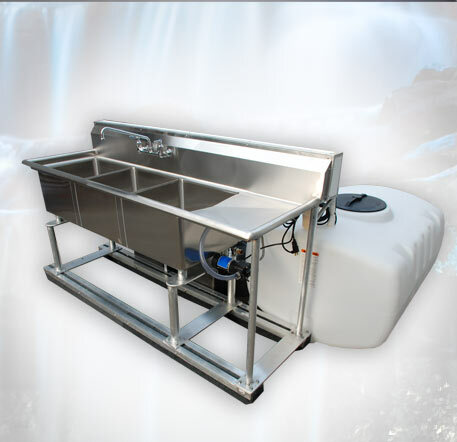 Even if your job site or event has no running water, this one-of-a-kind commercial sink will be connected to the CALLAHEAD developed PORTABLE WATER AND SEWER SYSTEM supplying 150 gallons of fresh water. Or it can be easily hooked up to a domestic water line. Our completely separate grey water holding tank guarantees zero chance of any water contamination. Available with our optional BOSCH HOT WATER HEATER the user has the added benefit of both hot and cold running water. A long neck 12” commercial grade faucet allows for water to reach all three large stainless steel sink basins for multiple cleaning stations. Designed with a built in stainless steel work shelf makes this sink a complete working station to wash, rinse and dry. 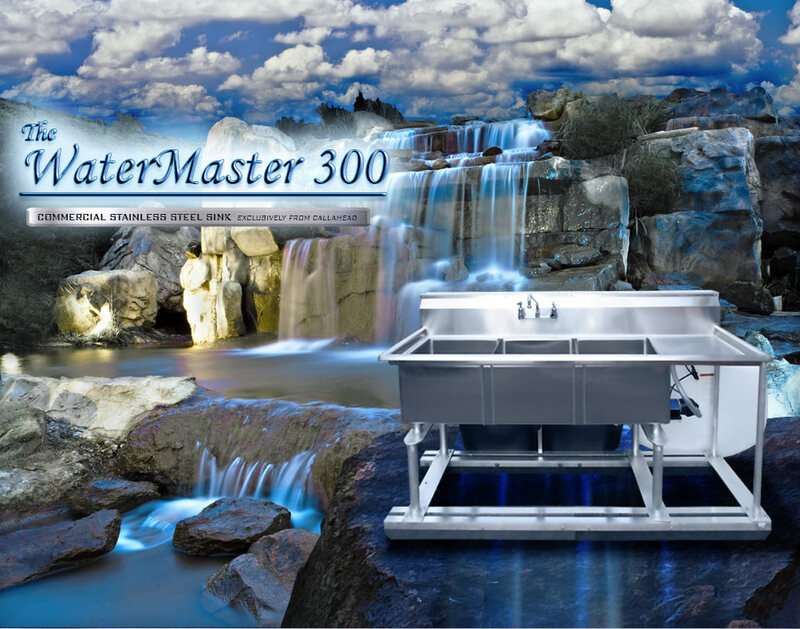 The WaterMaster 300 is guaranteed to make special event organizers and construction job site operators confident of being health code compliant. The largest variety of quality portable sinks available exclusively from CALLAHEAD the leader in portable sanitation equipment.